My Summer Readers have been reading about places all over the World this summer! On the bulletin board, we have a big map, and readers are sticking pins into the places that they have "visited" during their reading adventures! The Storytime group has visited sea creatures (snacks) that live in the oceans, hippos that live in Africa, and Polar bears that live in the Arctic. Other readers have visited France, Canada, and many of the US states. It is widely agreed that I have more interesting eyes. But it's good to see cats represented during summer reading, especially since Browser is still on his World Tour. I also posed by a Birdie. Now, this birdie isn't real, but it sure looks life-like! It was carved by Mr. Craig White, who is a really talented woodcarver and all-around great guy. (For a guy with a big booming man-voice, that is.) Thanks to Mr. Craig I can pose with this birdie and almost look like an Outside Cat! This next thing is not at all related to the overabundance of Tobers at the library. Now, I know I am a handsome Mancat, but I've never had an Admirer before. Well, wait a minute. . . I'm SURE I've had an admirer before, probably lots. And I did have a sweet and beautiful girlcat Kumari who I Loved (with a big "L") but she went to the Bridge. 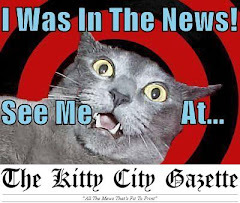 Anyhow, NOW I have a new admirer--the persnickety and lovely Miss Ali Zophia--who hijacked, er, borrowed Stella's blog to answer questions and confessed her admiration for my pretty (her word) orange furs. Thank you Ali--you are as wise as you are beautiful! Or as beautiful or as you are wise? How does that go? Anyhow, you are both! 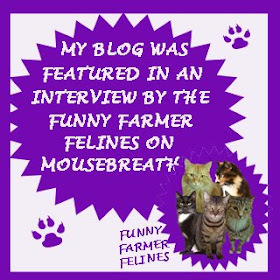 Nice of you to mention me in your blog today. It was interesting to read about the abundance of Tobers and the summer reading program at your library. blog again and put up some new pictures of me. She is lazy about blogging (and everything else) so it shouldn't be hard to do. Do you know how old you are, Tober? I am not sure how old I am, but maybe I can find out. Tober, how wonderful to have an Official Crush! Love is Grand. It is so exciting to see that you have permeated the entire Library, and with more than just Cat Furs. We highly approve of Humans who know what's what and put you first on their list. It's only right, seeing how you pawprint the paychecks around there! 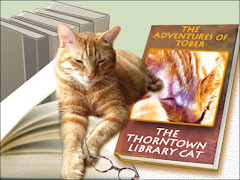 Tober you ARE the Thorntown Library. At least that is what I am assuming considering that I live nowhere near Thorntown. 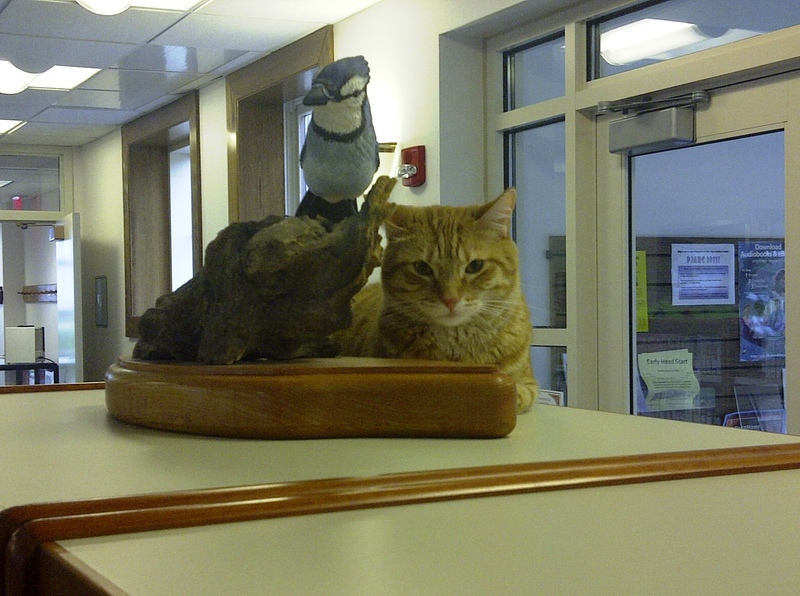 We wish there was such a strikingly handsome cat as you at our local library! Just one Tober would be fine with us. Tober, I saw your comment on another blog, and I had to come visit such a handsome orange boy. How neat to learn you are an orange library cat! I bet people come to the library just to visit your handsome face. 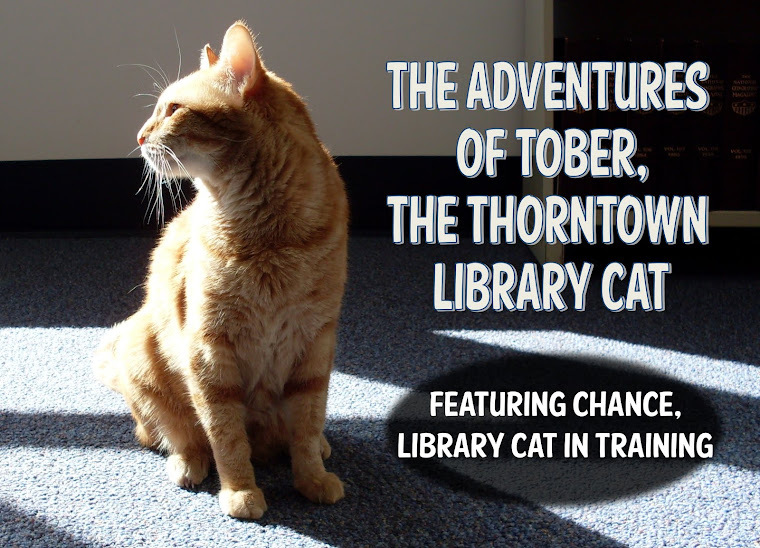 Well Tober, we think there should be pictures of you all over your library....and in libraries everywhere! All libraries should have a bulletin board dedicated to library cats! We are very glad you have a special somecat! You are definately more handsome that that cartoon cat & now you have a girl who's crazy about you! We can certainly see why Miss Ali has a crush on you, Mr. Tober. You're handsome, powerful, and important - what's not to like? We always love to read your blog to see who you fired each week. It looks like your staff has been on good behavior. That's probably a good thing - it must be exhausting firing people so often. Tober, we hope you have a safe and fun 4th of July!! !